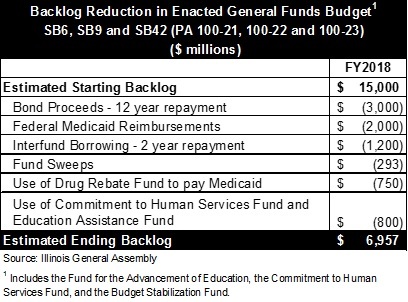 To break the logjam, the General Assembly narrowly overrode Governor Bruce Rauner’s vetoes of three budget-related bills with bipartisan support. The House of Representatives’ action on July 7 came two days after the Senate cast its override votes. The new budget for fiscal year 2018, which began on July 1, raises personal income tax rates to 4.95% from 3.75% and corporate income tax rates to 7.0% from 5.25%. The budget significantly increases spending on preschool-to-secondary education and fully funds State tuition grants for low income college students, while cutting agency operations by 5% and reducing spending on public universities and community colleges by 10% from FY2015, the last year when they were fully funded. Several major issues remain unresolved. The plan is designed to pay down about $8 billion of the State’s roughly $15 billion in unpaid bills, but it does not address the remaining backlog. A large portion of P-12 education spending was made contingent on an education funding reform measure that was passed by the legislature but faces a veto from the Governor due to its level of financial assistance for Chicago Public Schools. In ending the long budget standoff, lawmakers cited the near certainty that Illinois would become the only state with a junk credit rating if the impasse continued. And the risk remains despite the enactment of a budget. Before the House vote, Moody’s Investors Service said the budget might not go far enough toward improving Illinois’ perilous fiscal condition, including $129.8 billion in unfunded pension obligations. The budget package—covering revenue, appropriations and various budget implementation provisions—was not filed in final form until several days after the end of the last fiscal year on June 30. The Civic Federation is just beginning its analysis of the legislation. It is difficult to compare the FY2018 budget with the prior two years, when spending was curtailed in several areas due lack of a budget. In addition, the FY2018 budget shifts substantial amount of spending and revenues out of the State’s general operating accounts, further complicating any comparisons. The spending level in the General Assembly’s budget is $36.1 billion, compared with proposed spending of $37.3 billion in the FY2018 budget recommended by Governor Rauner in February. However, the General Assembly’s budget appears to be smaller mainly because it bypasses General Funds in the distribution of funds to local governments and transit districts. Instead of being deposited into General Funds and then transferred out, the money goes directly to other designated accounts outside of General Funds. The following table summarizes the FY2018 budget plan. As shown above, the increase in the personal income tax rate from 3.75% to 4.95%, just lower than the 5.0% in place from 2011 to 2014, is expected to generate $4.5 billion. The increase in the corporate income tax rate from 5.25% to the 2014 level of 7.0% is projected to bring in $514 million. Both increases are permanent. Additionally, the bill ends various corporate tax exemptions and deductions. Together, these changes are projected to increase revenue in FY2018 by nearly $5.1 billion. The Earned Income Tax Credit for low income taxpayers will be expanded from 10% of the federal credit to 14% in 2017 and 18% in 2018, sacrificing an estimated $209 million. The budget also relies on the Governor’s proposed sale of the James R. Thompson Center in Chicago, with an estimated sale price of $300 million. However, it remains to be seen whether the sale can be implemented by the end of FY2018 at that price. Together with smaller revenue changes, the total package is estimated to increase revenues by $5.5 billion over the estimated base revenue. The spending bill includes about $1.9 billion in additional appropriations for FY2017, mainly for higher education and human services. For FY2018 appropriations for P-12 education are $8.2 billion, an increase of $730 million from FY2017 and $480 million from the Governor’s proposed FY2018 budget. The increase partly reflects $350 million to implement the proposed educational funding reform and an additional $50 million for early childhood education. Group health insurance, which has received no General Funds appropriations since FY2015, is fully funded at $1.9 billion. The backlog of group health insurance bills stood at $4.9 billion at the end of May, according to the Governor’s Office of Management and Budget. Actuarial assumptions: Changes in required State contributions related to revised actuarial assumptions would be phased in over five years. This would allow the State to defer additional contributions required because of lower assumed investment rates of return or lower mortality rates. Legislative supporters said this change accounts for nearly $900 million of the FY2018 pension savings. Tier 3 plan: Universities and school districts outside Chicago will cover all pension costs for new employees. New workers would have a choice between the existing Tier 2 plan or a new Tier 3 offering that would have both defined benefit and defined contribution components. The State is expected to see $500 million in annual savings because the significant reduction in future pension liabilities would lead to a sharp decline in current contribution requirements under the State’s funding formula. Timing of the plan’s implementation is left up to the Teachers’ Retirement System and State Universities Retirement System. High salary employees: School districts and universities, rather than the State, would pay pension costs for teachers’ and university employees’ salaries above the Governor’s. The first two changes above generate savings by deferring contributions to later years and taking upfront savings on future liability reductions. No actuarial reviews of the changes have been provided. The pension changes do not involve benefit reductions for existing employees, which have been severely restricted by Illinois Supreme Court rulings in 2015 and 2016. In addition, the new budget incorporates changes requested by the City of Chicago to contributions and benefits in the Municipal and Laborers pension funds in 2016 with affected unions. Governor Rauner had previously vetoed standalone legislation that increased the City’s contribution levels and offered new employees an opportunity to lower the retirement age in exchange for increased employee contributions to the plans. Statutory transfers out of General Funds decrease by $2.1 billion from the Governor’s FY2018 budget proposal to $339 million from $2.4 billion. As discussed above, the main reason for the decrease is the direct deposit of State revenues into accounts designated to receive money for local governments and transit districts, bypassing General Funds. There is also a 10% reduction in income taxes distributed to local governments and sales taxes to downstate transit districts and the Regional Transportation Authority (RTA). In addition, about $229 million of State payments to the RTA that would have come from General Funds will come from the Road Fund instead. The budget plan shows an operating surplus of $360 million. The surplus could be reduced if the Thompson Center takes longer than expected to find a buyer or is sold for less than the projected price. Similarly, the timing of the Tier 3 pension plan will affect the State’s ability to achieve $500 million in savings on pension contributions. The plan to address approximately $8 billion of the bill backlog would pledge the estimated budget surplus to debt service on approximately $3 billion of general obligation bonds. The proceeds will be used to pay outstanding Medicaid bills, and the spending is expected to generate an additional $2 billion to pay down backlog bills through federal reimbursements. The bonds will be repaid over twelve years in level principal payments. It remains to be seen whether the State will be able to market this offering should it be downgraded to junk status. The budget authorizes an additional $3 billion in borrowing for backlog repayment, should additional revenues become available to service the debt. In addition to the $5 billion generated by issuing bonds, the plan calls for an additional $3 billion in backlog reduction. $1.2 billion will be borrowed from other funds and must be repaid within two years. Approximately $1.8 billion will be paid by other funds, including $800 million from the Education Assistance Fund and the Commitment to Human Services Fund, $750 million from the Drug Rebate Fund for Medicaid bills, and approximately $293 million in sweeps from other funds. The following table summarizes the backlog reduction plan. Illinois had not had a complete budget since FY2015 because of a political dispute between Governor Rauner, a Republican who took office in January 2015, and the Democrats who control the General Assembly. The Governor said he would consider higher taxes to fill a budget gap left by the partial rollback of temporary income tax increases, but only in exchange for economic and regulatory initiatives that were not agreed to by the legislature. As discussed here, Senate leaders tried to end the crisis by working on a bipartisan plan known as the grand bargain that included an FY2018 budget and policy changes urged by Governor Rauner. The Governor's budget proposal for FY2018, had an operating gap of $4.6 billion, which the administration proposed to fill by “working together on a ‘grand bargain.’” But the effort eventually stalled after most Republicans declined to vote for the negotiated legislation and Governor Rauner said he would not approve any tax hikes without a four-year property tax freeze. Without a full budget, the State continued to function because of court orders, consent decrees and existing statutory requirements. Public schools remained open due to full-year appropriations for elementary and secondary education. But other areas received partial or no funding during the impasse, including higher education, social services not covered by court orders, day-to-day agency operations and State employee health insurance. Recently the cash shortfall became so severe that areas that were supposed to be funded, such as public schools, had to wait months for State dollars. In response to payment delays for Medicaid, which is covered by federal consent decrees, a federal judge ordered the State to pay managed care companies an additional $586 million per month plus $2 billion during FY2018 to pay off accumulated bills. The State share is about half of the total due to federal reimbursements. Illinois Comptroller Susana Mendoza said the increased Medicaid payments would likely force reductions in payments to schools, pension funds, local governments and State employee paychecks. In a statement after the House override of the Governor’s veto, the Comptroller said it will still take years to pay off the total bill backlog. But the new budget means that the Illinois Department of Transportation will resume work on road construction projects that were shut down at the beginning of the week due to the lack of a budget. The Illinois Lottery has resumed selling tickets for the popular Powerball and Mega Millions games, which were halted in late June because the agency did not have budgetary authority to contribute to the prize pool.